3 Watt VHF – Select between 1 and 3 Watts for small boats and personal water craft. Large LCD screen – Large and bright LCD screen for easy viewing. Belt Clip – Easy to operate spring loaded belt clip. MR HH125- 3 Watt Waterproof Handheld VHF SKU: MR HH125 The Cobra MR HH125 is a fully featured VHF radio with a rugged compact design. It’s perfect for recreational boaters or as a portable backup on larger vessels. It comes standard with a removable spring loaded belt clip, lanyard and DC cigarette lighter charger. 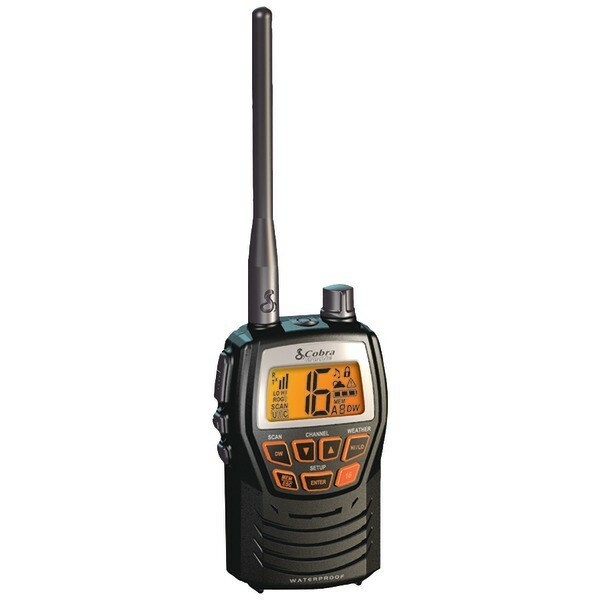 Anyone who lives, works or plays on the water needs one of these VHF radios. It is packaged with long-lasting rechargeable NiMH batteries that won’t develop a memory when charging. It can also be used with 5 standard AAA alkaline batteries in emergencies. The backlit LCD and keypad allows it to be used in low light conditions and will turn off automatically to conserve battery power. The built-in NOAA Channels and NOAA weather alert give you 24-hour access to local weather information. It also acts as an All-Hazards Emergency receiver and will alert you to weather, natural disasters and other emergencies provided to the National Weather Service by local and state government officials.